I've been doing a lot of spring cleaning. Let me reiterate--A Lot. I have no understanding of how certain items end up in my house. Or why certain items are still around...when they should have been thrown out during last year's spring cleaning. My freezer is no different. I had this brilliant idea that it needed organizing because I have no clue what's in there. At least not under the first 12 inches. Once I started digging, I found bags and bags of frozen vegetables. Seems like good intentions go to the freezer to die. This was a situation that called for quick action. A plan. 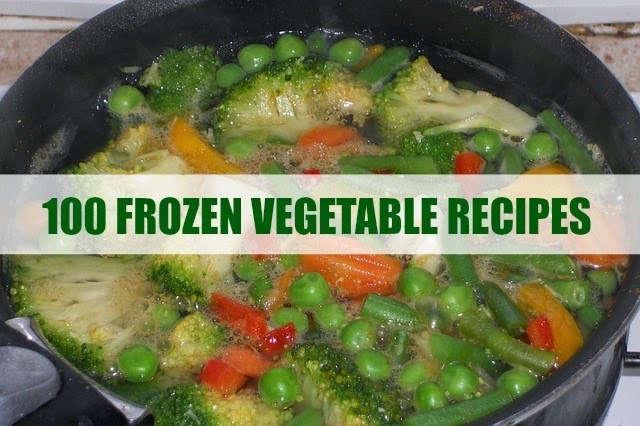 A categorized list of recipes that use frozen vegetables. And so here they are. A few of the recipes are indulgences for those days you're allowed a cheat meal/extra WW Points, or you can lighten them up by changing out calorie heavy ingredients. For example, the Tuscan Chicken and Broccoli Hand Pies call for one package of cream cheese, so I would choose a light cream cheese over original for this recipe. Don't be afraid to experiment with healthier ingredients. You'll often be surprised that you can't tell the difference in taste. Some of the recipes are quick, some are a little time consuming. There's just a mix. I hope you find a new favorite or stumble on to an old one you've long forgotten. As always, I love to hear about your favorites, so please feel free to leave a link to yours in the comment section. Slow Cooker Lentil & Veggie Stew, Skinny Ms.
Quinoa and Vegetable Stir-Fry, Skinny Ms.
Visit my frozen vegetable recipe board on Pinterest!